Ugh, whats with all these developers and publishers speculating on poor sales of old indie games. Didn't sell well, get over it. If you love your franchise so much then why not focus on the sequel instead of blabbering about how much the first one was a failure. There may be some truth to what he says. Not to generalise, but I'd of thought that the Japanese would have snatched up this game. Reagrdless, Okamiden will be mine! fffuuu, I still don't have the original Okami yet. I was supposed to get the Wii version, but with my gigantic backlog of games it just hasn't happened. Okamiden also looks very appealing. EXACTLY! Move on from past failures. It didn't sell well, but let me say, it was a fantastic game. There is no shame in making a game that everyone who DID play it, loved. By the time you get Okamiden out, the 3DS is gonna hog the spotlight. Still I hope it does well, I liked Okami. Their timing WAS really bad, and it's kind of bad again this time with the 3DS and all. But I still own two copies of the first Okami and I'll definitely buy Okamiden, on the first day hopefully. I don't see why Motohide is making this statement now. PS2 WAS an aging console, and I'll assume the Wii version did alot better, since it earns no mention in this negative outlook. And I still like the PS2 version better than the Wii port. Okay, I agree on this. I had never heard about Okami until the Wii version. I was suprised to see that it had a PS2 version (which I now have). So yeah, I agree with him. You know, I have to wonder if the developer really did 'blame' the excitement for the Ps3. It is entirely possible that this blog entry follows the typical 'hyperbole now and explain later' model common today on Web news. So did he 'blame' the Ps3 anticipation or simply express his own observations? The actual article clearly shows that was not 'blaming' anything, but just stating a reasonable observation of a simple fact. Okami never got its moment in the sun. Ironic for a Sun God. OT: I thought it was an amazing game, and plan on getting Okamiden. But I've only ever played it on the Wii, with the celestial paintbrush mechanics it just seemed like a game that was made for the Wii. To tell the truth, I can't remember how I heard about Okami when it came out, but I do remember that it had quite a discrete release. I'm glad I got it though (on PS2), seeing as it's one of the best games I can remember playing in a long time. Everyone I know has a copy of it. 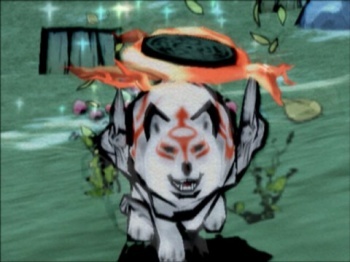 So do I.
I'd say its more likely that Okami didn't actually look that great... It looked artistic alright, but I found it was kinda hard to tell what you were supposed to be doing in any of the screenshots I saw. It seemed like it looked nicer than it played. But the critics did say some good stuff about it though, so it probably is a great game but I don't think it was an easy game to convince anyone to purchase. You know the funny thing? My PS2 is as old as the commercial PS2 is and it works as well as - if not better - than my other consoles. The PS2 may be aging (hell, it was aging then) but damn if it didn't age well. PS3 is a much better console now (with all of it's new exclusives, it's rebranding, and cheaper price), but back then (2007), not so much. That's still leagues ahead how many copies mass effect 2 sold. Last I remember, it was under 7 thousand copies. So, you're putting this on the DS, with the 3DS right around the corner? Anyway, first game was awesome. Clover Studios closed and is now basically Platinum Games, so my faith in Okamiden to rock my world is lacking. Hell, the 3DS will be out before the game. actually its not they were talking about the american release dates for both things. game march 17th, 3ds march 27th or something like that. It is cutting it close to the 3ds release date though, I will give you that. Also it has that beast waiting in the shows, new pokemon games, to deal with. signs dont look good for it. Well I bought the first Okami ages ago and loved it. Being a 360/PC exclusive, in Japan, is like a death sentence. They don't like either platform. Nevermind. Your post said Amercian release date. DAMN YOU BRAIN! Read all the words! I wonder if it really was the PS3 announcement or if it was just that Okami paired badly with the PS2. Honestly I find it astounding that they didn't start with the wii considering that they eventually ported it there. The wiimote swish/flick motion really fits better with "painting" mechanics than a control stick. I wonder how well it would have sold if it started on the wii. Whatever genre Zelda/Okami is, it's not that popular. How many FPS games sell a year, 50 million? Zelda sells like 5 million every 2-3 years? Maybe the FPS market is over saturated but there is definitely a market. The fact that Okami was a well publicized game and still didn't sell makes it look like the audience for Zelda style games isn't that rabid--also, the fact that it was released in close proximity to a Zelda game probably didn't help it. It's because it's an interesting, intelligent game. That's why it didn't sell well. Beyond good and evil had the same problem. SO what they're saying is that Okami was sort of like the band Live when Nirvana hit the streets and changed the rules. it was well publicised? I only saw reviews for it. No advertisement whatsoever. Without word of mouth i would never of tried it. The marketing behind was rather weak tbh. It won't sell either; the Japanese don't care much for western videogames. OT: I always guessed it was the cell-shaded visuals that put people off, aswell as Capcom simply screwing up the marketing. Still, I bought the sucker day one and I couldn't have been happier. I strongly disagree with his assertion that there was nothing wrong with the game. I submit that it sold poorly because it was full of broken controls (at least the Wii version was) and people like their games to actually WORK. I'm sensing a bit of Warren Spector from this guy. "No, I didn't make a bad game, my game is the best! It's the rest of the industry who just doesn't understand my awesome game, poor me!" I feel like ign covered it pretty well since it was announced--then again I liked Viewtiful Joe and might have been a little bit more tuned into it already. I guess Shadow of the Colossuses sold alright without anything but glowing reviews, and I guess, genre wise, I'd put it alongside Zelda and Okami. I don't think Capcom was keeping the thing a secret.